Check out our New Blow-Out Sale! We’re offering great deals on all of these local trade-in units! Carteret RV features Park Model Homes by Canterbury, Forest River and Woodland Park, as well asWildwood by Forest River X Lites, DLX and other popular Wildwood Models! We also offer Parts, Accessories, Service, consignment and trade-in opportunities. If you have been trying to sell your travel trailer, park model, fifth-wheel, motor home or any type of recreational vehicle, we can help! Visit our sales office, call or Contact Us to get started. Our goal is to be the trusted destination for all of your RV purchase and service needs while ensuring a smooth and enjoyable road in the process. We hope you will stop by and visit Carteret RV today! 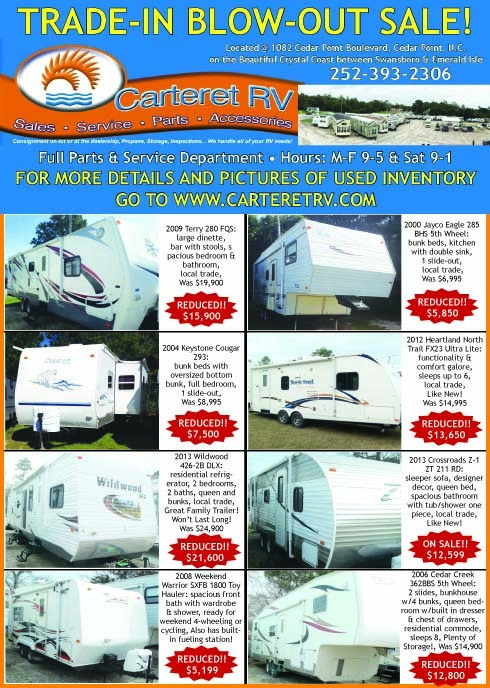 Posted in Carteret RV, Destination Trailers, NC RV Dealership, Travel Trailers, Wildwood | Tags: fifth-wheels, NC RV dealership, pre-owned RVs, recreational vehicles, travel trailers, used RVs | Comments Off on New Blow-Out Sale! « Happy Holidays and deals from Carteret RV!